How to Order solder paste stencils? 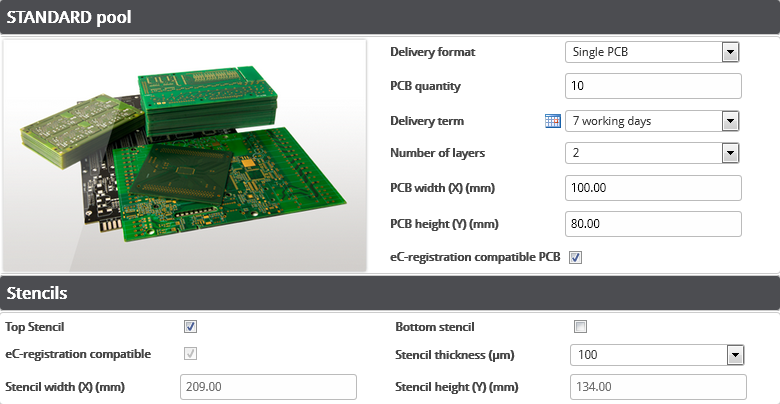 eC-Registration compatible solder paste stencils and custom solder paste stencils. 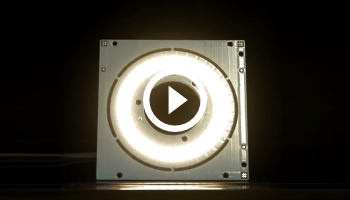 Both are laser-cut from 100 or 130 micron stainless steel. 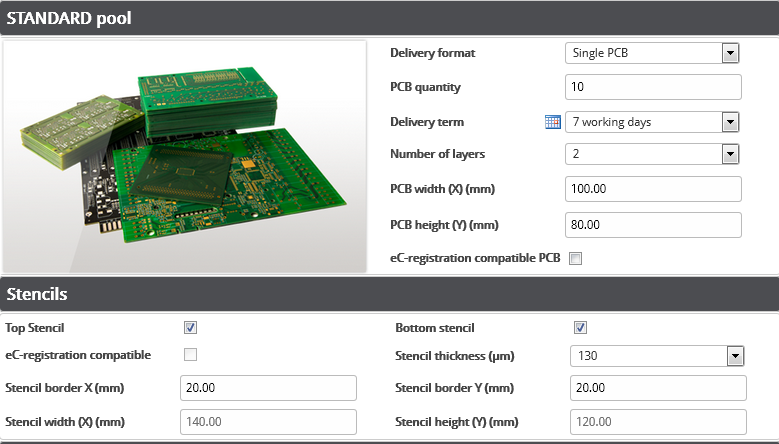 Stencils can be ordered together with a PCB ( panel) in our Calculate and Order interface, or with our Stencil order module. 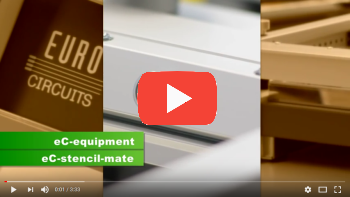 The stencils that fit our eC-stencil-mate and eC-stencil-fix are called eC-Registration Compatible Stencils and are produced with special tooling holes according to the unique eC-registration-system. The eC-Registration System is a simple pin registration system offering high accuracy and an ease of use. To accommodate the tooling holes required on the PCB to fit the eC-Registration System, the PCBs need a border and must be ordered in a panel. For single circuits, we make a 1-up panel for you. A custom stencil is made from your paste layer. You can define online the borders you require on each side (minimum 20 mm). 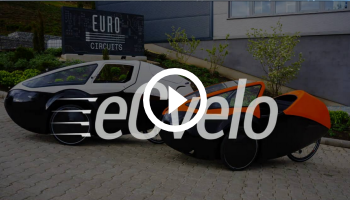 Do not select eC registration compatible. Add your job to basket, and upload your data. If you supplied a paste layer with the PCB we will use that to make the stencil. Otherwise we will build a paste layer from the surface-mount pads. 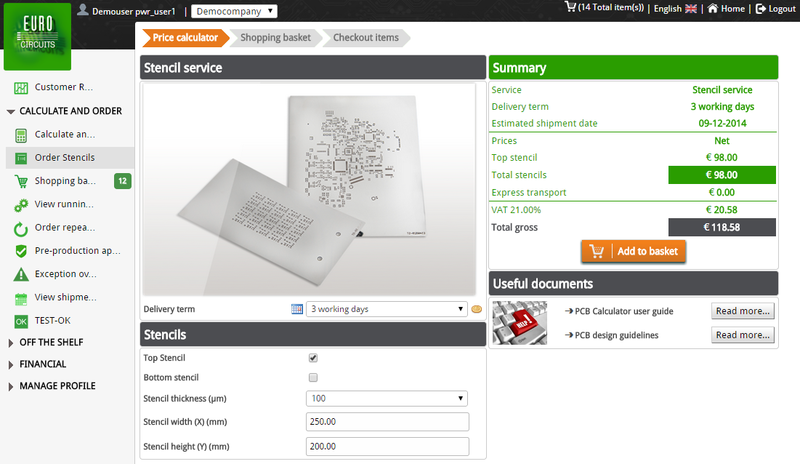 This tool allows you to order a stencil independent of a PCB order placed with Eurocircuits. It can be useful if you forgot to order your stencil when you ordered the boards, or if you want to have custom tooling holes in the border. These are not provided if you order stencils with the boards.